Question: Noel: HI! I'm making a new top for my boat. It snaps to the top of the windsheild, goes over the tube framework, and the corners drop down and snap the the sides of the boat. My question is what do I need to use around the outside edges, where the snap fasteners go, to reinforce it. Or is the fabric strong enough to hold them? Any advice you can offer will be greatly appricated. Thanks! Answer: Dear Noel: In our canvas shop, we cut strips (2" or so) of a laminated vinyl material and sew it to the edge where the fasteners go. One layer along with a layer of your top material is sufficient to hold the snaps. 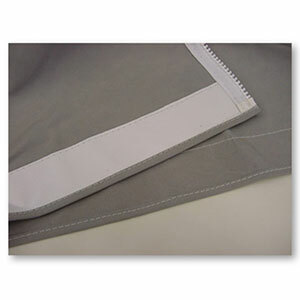 To finish the outside edge, you a can either sew 3/4" binding to the raw edge, or add 1/2" to your top material and fold the 1/2" under the vinyl laminate. 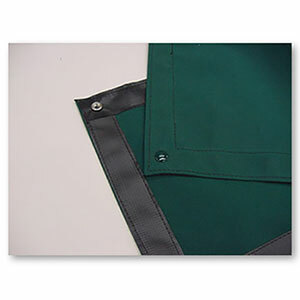 Since the vinyl won't ravel, you don't need to worry about finishing the "raw" inside edge. These pictures may help...the first one is the one with the binding. The vinyl laminate is sold by the yard and is 60" wide, so you can cut it to match the curve of your top, if necessary, or in straight strips. It is available in black, white and blue.